The Bohemians are dedicated to perfectly re-enacting the glory days of the greatest rock band ever: Queen. 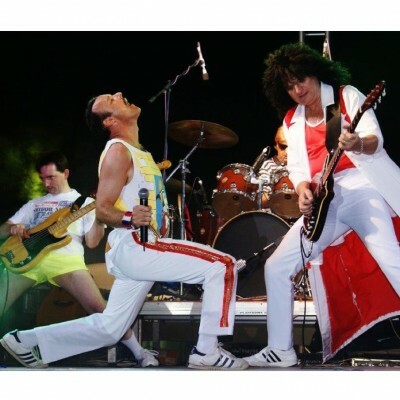 With skills and expertise that set them head and shoulders above the rest they are the most exciting Queen tribute band around. The dynamic band are sure to rock you when they play a stage near you. Comprised of lead guitarist Christopher Gregory, drummer Wayne Bourne, bass and backing vocals by Kevin Goodwin with Rob Comber playing the all-important role of Freddie Mercury through his singing and talented playing of piano and acoustic guitar. Seeing out they end of the year, The Bohemians take over The Hub at Plymouth on Friday 16th of November 2018 for an almighty show that you must not miss! They have already booked a massive gig for 2019. See them at O2 Academy Glasgow on Friday 6th of September 2019. As you would expect, as the excitement builds then so does the demand so you will have to act fast and book your The Bohemians tickets fast before they are all taken. You can place your order with Gigantic for your chosen gig tickets using your smartphone, tablet or computer 24/7 either whilst busy on the go or when relaxing at home. Their concerts have seen they play all across the UK, Europe and beyond having been hired for festivals, football stadiums, theatres and other extremely prestigious stages. With performances rivalling the original band, they have received standing ovations from wildly ecstatic audiences. Formed in 1996, they have honed their spectacular show which includes lighting, backdrops and amazing pyrotechnics. Don’t stop Rob Comber having such a good time. His wild onstage antics summon the indomitable style of the world’s best ever frontman. With Wayne Bourne and Kevin Goodwin providing the perfect playing and Christopher Gregory’s Red Special all allow these champions to channel the sound of Queen. With limitations on the amount of The Bohemians concert tickets being made available for sale, we do urge you to act fast and book yours before they have been snapped up. Offering a huge choice on a wide selection of essential gig tickets plus excellent customer service, Gigantic has been named by Nottingham Post as their ‘Retail Business of the Year 2017’ meaning you know we are the right place to come whenever you are booking for your big night out.